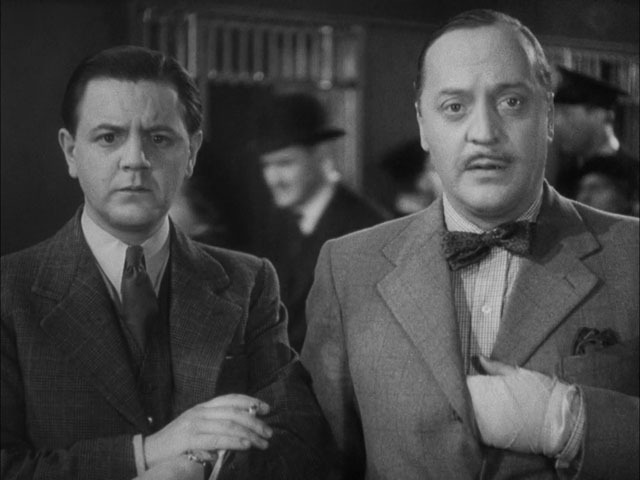 We’re talkin’ serious OLD SCHOOL British twit comedy duo, too – Charters & Caldicott, the two Cricket-obsessed comedy relief characters first seen in Hitchcock’s The Lady Vanishes in 1938, returning in our first film to discuss, Carrol Reed’s Night Train To Munich (1940). Night Train To Munich comes across as a clear attempt to crib Hitchcock. Never mind the same screenwriters of The Lady Vanishes & the presence of Basil Radford & Naunton Wayne as the aloof self-absorbed Cricket fans caught up in the middle of the action. We also have the identical star Margaret Lockwood as our plucky heroine, ably assisted by a sarcastic and smug Brit charmer who she first hates and then (of course) falls for. In Lady Vanishes, he’s played by Michael Redgrave. In Night Train, it’s Rex Harrison. Lady Vanishes manages to balance the droll Brit humor with a nice Hitchcock spy plot and twists, with Lockwood getting boinked on the head and then being told that the sweet little old lady who looked after her and shared tea never actually existed once she vanishes. It’s got a lot of the Hitch formula we’d all grow to love even more with later movies – the average person caught up in the international conspiracy, the mystery/suspense, the use of a train in the plot, and so forth. But Night Train To Munich one-ups Lady Vanishes in some ways by providing us a more complex spy plot – this time with Lockwood as the daughter of a Czech scientist the Nazis are trying to kidnap and return to Germany. Harrison plays the British agent who disguises himself as a Nazi to trick the actual Nazis and lead Lockwood & dad to freedom. The comedy and intrigue balance excellently again, thanks to the same screenwriters, and this time our pair of British comedy relief twits, Caldicott & Charters, actually do more than just shoot back at the bad guys, they are recruited by Harrison to join in the caper. The characters proved popular enough to appear in other British movies and get their own radio show, as well as be played by other actors in later incarnations, including an updated 1980s TV version where the two dimwits solve a different crime every week. But Radford and Wayne would often appear together under other character names, doing the same schtick (not sure what the British word for it is – a jape? a bloody joke?) in other films. They appear in a comic segment of the wonderful horror anthology Dead Of Night (1945) as two fanatic golfers (enough with the Cricket, said some producer) who haunt each other’s love lives. And just to make sure everything is related to everything else, one of the better segments of Dead of Night features Michael Redgrave as a ventriloquist whose insanity brings his dummy to life, with possibly the best cinematic use of midget EVER in a nightmare finale. Best Cinematic Use of Midget ought to be an Oscar category. Anyway, it was nice to see familiar faces when I dialed up Night Train To Munich on the DVR, and decided to go back and watch Lady Vanishes again. British twit humor certainly evolved into the next generation with bits by The Two Ronnies or Fry & Laurie or in the Derek & Clive material of Peter Cook and Dudley Moore – but a lot of the speech, cadences, Britishisms and so forth can clearly be found in what Radford and Wayne did back in the 1930s. Next up – more noirs, some documentaries, and (EEK!) some foreign films. I got a lot of other work in the next weeks, however, so I won’t be blogging as often as in the past few. But who knows? Maybe I’ll play hookey. Stay tuned.